The main course was nicely presented. A Wellington always makes an elegant centerpiece. So, stop worrying about what to serve this weekend to your guests and start debating the merits of pairing a lighter red Pinot Noir (or Côtes du Rhône) or a white wine like a Viognier with the dish. several strips of bacon or cured ham like proscuitto. 1 container of Boursin herbed soft cheese. 1 egg and a dash of water. Parchment paper and a cookie sheet. Trim the silvery part from the tenderloin. You can probably dispense with the tail end, too, for symmetry. Or fold it over to maintain the more uniform thickness better for even cooking. Heat a tablespoon or so of olive oil in a large skillet. Salt and pepper the tenderloin, wrap with the bacon or ham and sear in the olive oil. Spread with the Boursin cheese. Wrap with the puff pastry sheets. You’ll put this on the parchment paper on a cookie sheet, seam side down. Brush with an egg wash (beat the egg with a little water.) Chill for an hour and heat the oven to 400ºF. Bake for approximately 40 minutes on the lower rack of the oven. Let stand for 5 minutes before slicing to serve. The Pork Wellington was served with an orzo, feta, black olive and roasted vegetable side dish. I brought along a salad made with a vinaigrette spiked with orange juice, tomatoes, celery, cucumbers, red onion, blood oranges, blue cheese and walnuts. This entry was posted in Entertaining and tagged dining, dinner parties, Entertaining, Living, recipes. Bookmark the permalink. 7 Responses to Wellington: The Swine! I think I just might give this one a try. 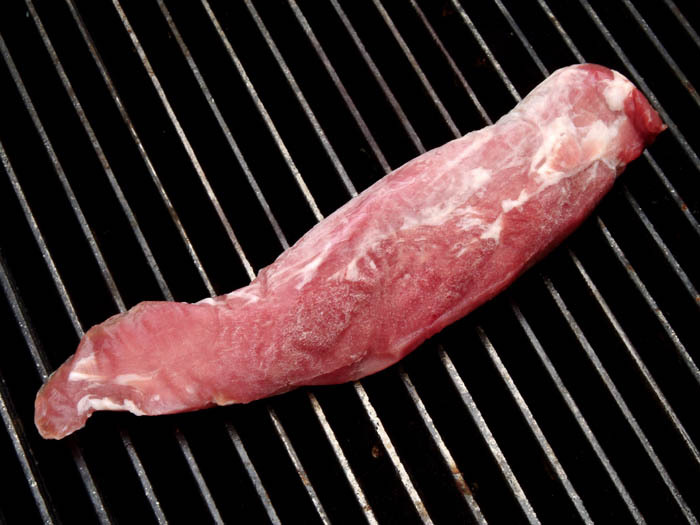 Pork tenderloin can be so bland, but this recipe sounds quite flavorful. What? No pix? Love a good viognier! My friends have a winery somewhere south of ch-ville and i first got to try it there… yummmmmmm. Peak– the Boursin really notches up the flavour. I don’t think I’ve forgotten anything in the recipe…. forgot my phone has a camera integrated I could have used! I’m still getting used to all the mod cons. P-D — good friends to have! (And good Virginians. Acte 12[I think] states that for every acre over five that you own you’re required to plant a certain number of vines.) The grape does really well in VA soil. It used to be used as just one element in a wine but is really coming into its own. THey’ve got a big old spread down there in Amherst… lots of acres, but about 20 or so planted in vines. The place has been in their family since the War of Northern Aggression! Cheese on anything or in anything is a yes for me and my family! Bacon is a runner up. Love it that you post so many great recipes. Shame my culinary skills are less than spectacular . . . Thanks TIG, it’s just a case of practicing. And really loving to eat….